It’s winter and it’s cold Brrrrrr! It’s winter and it’s cold Brrrrrr! I can’t remember where I heard that little jingle but it rings in my head almost every winter. I sang it to my kids when they were little and now my grandkids. This winter the chickens and our old goat Allie and singing it to me when I go out to the barn. We are in the middle of a prolonged cold snap, although cold might be an understatement! I’m trying to keep the critters as comfortable as possible. Our nights have been below zero and some days never rise out of the single digits. For the chickens, I have a heater in their water bucket, it keeps it from freezing but some mornings the lid is frozen shut, making it difficult to top off the bucket with warm water. I have to open the door to the outside pen to help remove moisture from their coop or they could get frostbite. If the sun is out they enjoy basking in the sunshine in their pen. I also give them a sunflower seed snack at night to help keep them warm. 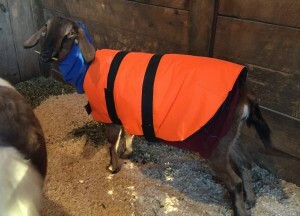 Our old goat Allie has been showing signs of being cold, so I bought her a custom made goat coat just before the temps really dipped down. It is nicely made but just not warm enough for her. I saw the same company sold fleece belly bands and neck bands for added warmth. I new I wouldn’t be able to get them here before the weather got even colder. I had an old fleece neck gator I made for myself but seldom used. It fit her fine and she seemed to like it. Next I went to Salvation Army store and bought an old fleece shirt. I cut off the sleeves, cut them open and sewed them onto the body of the shirt. The result is a nice long belly band for her. I’m not positive but I think she likes the result. Posted by Maryclaire Mayes on Sunday, December 31st, 2017 at 04:54 and is filed under General.